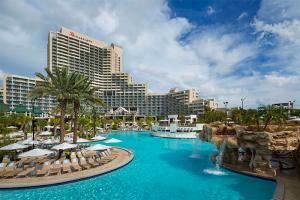 At Orlando World Center Marriott guests find amenities at every turn. Dive into the Falls Pool Oasis, featuring two, 200-foot water slides, kid’s splash park and nightly laser light show, or hit the links with a round of golf at the championship course. Guests can also enjoy a variety of tastes across 10 restaurants and lounges. And for those who just want to unwind, rejuvenate with a treatment at the full-service spa. At Orlando World Center Marriott, this world is yours. Located only 17 miles from the Orlando Airport and only 1.5 miles from Disney World. Siro Urban Italian Kitchen, Solaris, High Velocity, Hawk’s Landing Steakhouse & Grille, Mikado Japanese Steakhouse, Falls Pool Bar & Grill, Central Pantry, The Lobby Lounge.